Yeah that was me - it was the vortex race drone that I was designing back then. Ahh thought it was, I remember your fpv Eurofighter too...fantastic plane. Cheers chaps - I'm off to scratch my head and think what I can do with the bed/frame design. Well I've been playing around with it, and unfortunately I'm just not going to be able to get the work size I want to work in the space I need if going with the raised gantry type design, at the moment the work area is more important to me than absolute rigidity. That said, taking on board that feedback I will be tweaking the design a little to take the 15mm mounting plates higher up (thus making the gantry arms effectively 40mm thick until they leave the bed surface) and I can also move the gantry down by about 14mm and make it line up with the bottom of the z-axis without losing any clearance... I can also switch from 20mm plate to 15mm plate for the main bed which would allow me to drop another 5mm off the gantry height. All adds up! 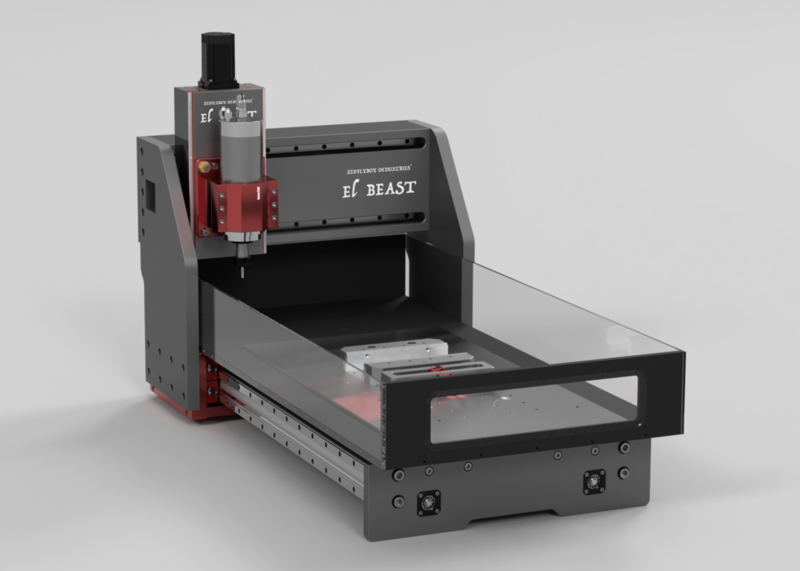 Given that the current machine does a pretty decent job of aluminium already, I hope that the re-designed Z-axis and the significantly beefier gantry arms (current ones are 150mm wide and 15mm thick vs the new one at 250mm wide and 25mm thick will be more than sufficient for my needs while giving the larger work area I need. Just looking back again at your design, why the 2 rails each side of your Y axis? One rail will have more than sufficient strength for anything you can throw at it? Its now a 40x200mm ITM profile vs the 160mm before... in addition to that, I reasoned that given that I was having to put 20mm spacers on the carriages to bring them in line with the ballscrew block, I may as well put that material into the gantry strength instead and raise the rails themselves out by 20mm... to that end I've designed a 20mm thick plate that will be mounted to the profile, then the rails will attach to the plate... the centre will be machined out to accommodate the motor mount and ballscrew bearing block. The back is 12mm plate, and the top and bottom covers I figure may as well be made structural, so they are now mostly comprised of 4mm plate and will be screwed into the profile top/bottom, which I figure should help a little to reduce any deflection from forces in the Y-Axis. Oh and just out of interest guys, is there anyone in the south east here (I'm horsham based, south west of gatwick) that has a machine big enough to just accurately size up and drill a 1040x520x15mm piece of plate for some beer money? I generally order from aluminium warehouse but they always come with -0/+2mm on dimensions and it would be nice to get it sized up more accurately and the holes drilled on a CNC to save me trying to mess around with jigs and figuring out how to get the width and length accurate. It would just be a case of whizzing up to 1mm off the edges and drilling some mounting holes, no skimming required or anything. Last edited by Zeeflyboy; 17-02-2017 at 02:49 PM. - I've just brought the end plates within the work envelope of my current machine so that I can do them as a single piece, narrowed the bed slightly to allow the 15mm gantry mount plates to extend up to just beneath the bed surface. - Gantry profile extended from 40x160 to 40x200, plus the extra 20mm of plate for spacing out the rails, back plate bumped up to 12mm. 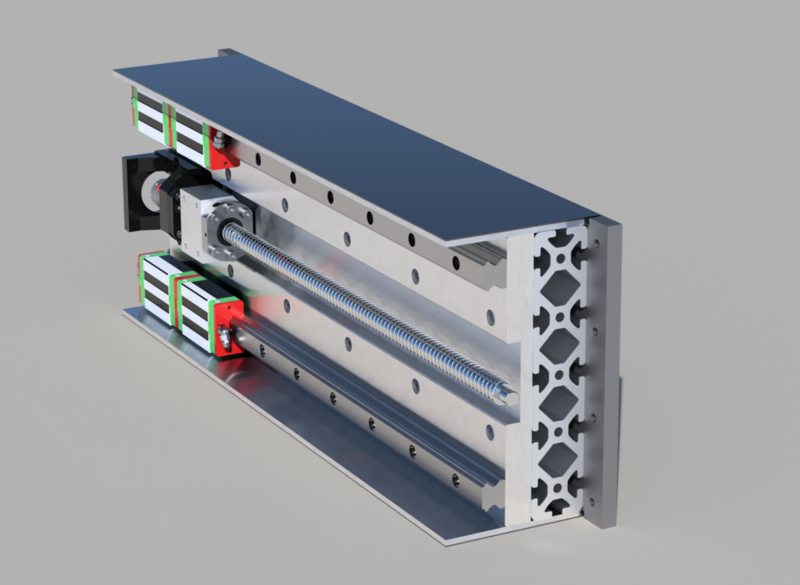 - Moving rail Z-axis design. Last edited by Zeeflyboy; 18-02-2017 at 02:42 PM. That's exactly what I meant on CNCZone about those end plates. Did you do the same change for the bottom end plate? The one moving the gantry? I think even that should be made of one piece, not two.